A selection of the bowls and mugs available at the pottery sale. Usually putting “pottery” and “smashed” into the same sentence is a bad thing, but not for Brandon University ceramics students! 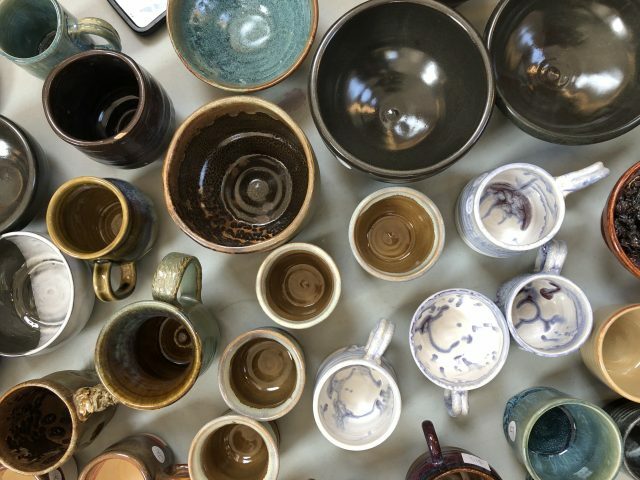 This year’s student pottery sale smashed their old record by raising more than $1,800 for students and the ceramics studio, toppling last year’s record of $1,200. The extremely popular sale, which featured one-of-a-kind handmade pottery bowls and mugs, was held Wednesday, April 4 in the Mingling Area of the Knowles-Douglas Student Union Centre. Most of the products were offered for sale at $10 or $15 apiece, and a crowd quickly snapped up the most coveted works. In previous years, the sale has helped send four students to attend the National Council of Education in Ceramic Art conferences. Students Lauren Teterenko, Alyssa English, Kristin Smart, Jill Gervais, and James Kilpatrick contributed works to the sale. The BU clay studio is also on Instagram at @BUclaystudio.